Have you ever had the feeling that your website is not as fast as the tests tell you it is? And do you wonder why? We talk about and work on website speed and performance with developers and website owner every day, and in this article we are lining up a few testing methods that may help you on the path to make websites with super snappy response times. Let’s just say it out loud before we start this; you think your website is fast because you are testing your cache. When it comes to web performance, it is important to pay attention to how it feels. After all, web performance is all about perception. Especially when something feels slow, it always is because it actually is slow. Hosting companies (maybe also some agencies) tend to show you tests that deliver results that are in line with the recommendations from Google Insights or point you to looking at a PageSpeed score on Pingdom Tools. But how can it be that the feeling you get when browsing your website differs from the results you are looking at in the online tests? The most common reason is that the tests you run do not provide results that are equivalent to a normal, random visit to your website. What people tend to do, is to run a test in Pingdom Tools, and then re-run it a couple of times until it produces the loading speed numbers that are acceptable. But doing this is tricking only the test, and does translate into the experience your website visitors get. Visitors to your website do not reload the page when they land on a page on your website, they move on, read, and hit the next link they find. To make a website truly performant, you will have to deliver fast results on this very first visit. Before we dive into how you can make a website fast on the first visit, we’ll provide you some techniques to test the real underlying performance of your site. There are a variety of testing tools available that you can use to check the performance of websites. We usually just use the waterfall analysis in Chrome’s developer tools from our own laptop, but if you find it easier to use online tools like WebPagetest or Pingdom Tools that is perfectly fine too. We avoid GT Metrix, because it produces unreliable results, especially when you want to test the underlying performance of your website. The first thing to be aware of is that users do not just enter your website through your front page. If you check out the landing pages view in Google Analytics you will probably find that you have visitors that land on close to every page on your website. The front page usually has a larger share than many other pages, but even if 30% land on your front page – there are still 70% of visitors landing on other pages. There is also a large share of visitors that have never visited your website before, you can get the details in your New vs Returning Visitors report in Google Analytics. New visitors do not have any page elements stored in their local browser cache, and the full page and all its assets have to be delivered before you can view the page. Simulating a fresh new visitors experience can be done by adding a cache buster to the pages you test. A cache buster is a parameter that you add to the URL of your website, to make the request bypass any full page cache you may be using. The parameter needs to be unique for each load of the page since the request, with those specific parameters, will be in cache after the load. We usually use https://domain.tld/?cache=busted and then add a number after busted for each page load. So you might ask – why would I want to test my webpage without hitting the cache? The explanation for this is dreadfully simple – your cache does usually not work when visitors land on your website. WP Engine primarily bases their hosting speed and performance on caching. Their own website is a perfect example of how caching does not work very well for websites. We tested their site with Pingdom Tools. The first test of their front page loads super fast, in 0.13 seconds. That is a result which is well within the recommended thresholds outlined by Google PageSpeed Insights and other similar recommendations. WP Engine’s front page with the cache buster added loads in well over 1 second, which is way over the recommended limits for good web performance. To re-run tests with cache-busters, make sure to change the parameter ?cache=busted to for example ?cache=busted2 – else you might be getting cached results again. There are two absolute truths for caching that you need to know about. First, caches need to be filled before they can be used. That means that caching as a performance enhancement, will never work for the first request. The second important thing is that caches always expire. This means that even though you cache a page now, the cached page will at some point be erased from the cache – and the cached element needs to be rebuilt. Caching as a performance enhancement is widely recommended by close to all hosting companies. The reason for this is that full page caching always will have a positive impact on resource reduction on the server level. However, this does not automatically mean that full page caching will give your website overall better performance. In our article about How Caching Works in WordPress we spoke about the origins of caching on the web, and under what circumstances caching can be effective. Full page caching can be effective for scaling, or if you have largely static web pages. The problem is, that is not how the average normal WordPress, WooCommerce or Magento websites are built. How caching works live in action, is that full page caches only provide performance improvements for recently accessed pages (good for scalability, but limited effect on performance). To use WP Engine as an example, we ran a crawler against their website to check out the number of pages that responded quickly, and which did not. The following graph shows 189 largely random requests that the crawler made to the WP Engine website, organised by response time in seconds on the vertical axis. 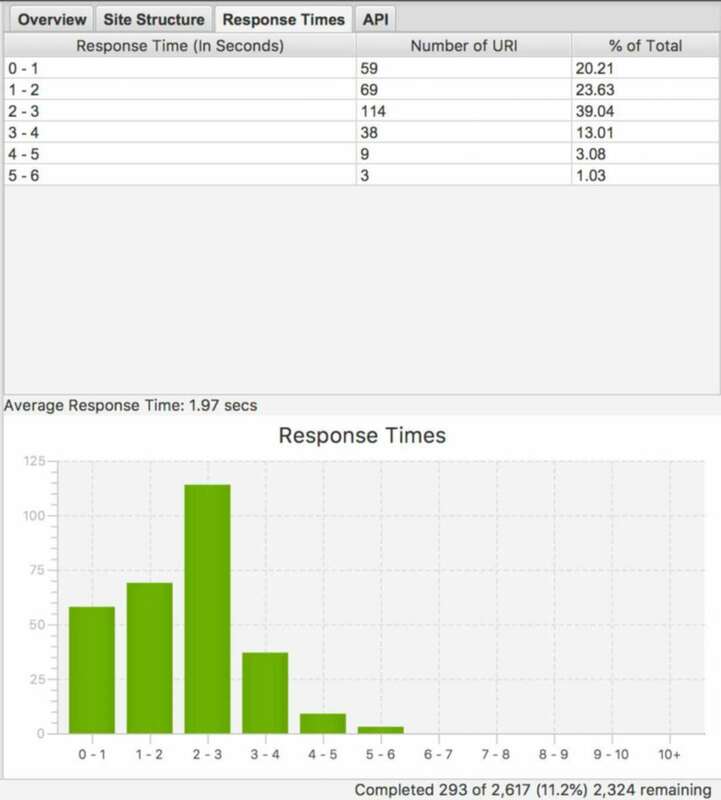 Of the 189 requests only 12.4% of requests responded within 400ms. Hence, 87.6% of their pages responded in more than 400ms. What’s worse – about 50% of pages had a more than 1 second delay before being delivered. Is it acceptable to deliver a loading time distribution like this, and if you would be happy with that for your website? Google Insights has outlined the limit 200ms as the number for acceptable response time from websites on desktop networks, and for mobile websites this number is 400ms. The problem with these requirements is that they are never true for e-commerce sites. They are also very seldom true for other normal websites. The kind of sites where all of the requirements are met can for example be online newspapers and magazines or some times blogs, where dynamic parts of the site are offloaded to external services. Caching as a performance enhancement does also not apply to all parts of your website. The effects of full page caching are limited to work for anonymous users on your website. It is possible to cache more dynamic pages, but then we move in to a territory that is complex and advanced, requires a lot of setup, maintenance and introduces a lot of new complexity both for developers and website owners. What we’re saying at Servebolt is that full page caching is like bad make-up. At a distance it may make your site appear good looking, but if you look closer nothing has really changed much. Stop hoping and tricking yourself into believing that you can solve your web performance problems with full page caching, you won’t succeed! Google crawls your website continuously every day, and provides some statistics that you can find in Google Webmaster Tools, Crawl > Crawl Stats there is a «Time spent downloading a page» graph. This metric often provides a good indicator of the base performance of your website. What is the average value for your site? If the numbers are above 500ms on average, there is a lot of room for improvement. It is also very common that sites with full page caching have varying data from day to day, where the crawler is “lucky” one day and hits some cached pages, while the next they crawl the uncached parts – and get high response times. This reflects what regular visitors to the site experience. The cheapest and easiest way to get real performance data from your websites visitors is to use the Speed Reports in Google Analytics. They are by default configured to sample only 1% of your website traffic, which for most websites means that the data is useless by default. You will therefore have to increase the SiteSpeedSampleRate to for example 50% or 100% to get useful metrics (adjust it according to max 10 000 page views per day). This graph is from a site that switched from dedicated VPS hosting with caching to non-cached managed hosting. The server response time dropped to a fraction, and the average full page load time was sliced in half. We use crawlers to get a real view of how websites perform. By crawling all pages of your website, you will easily be able to identify page types or specific pages that perform worse than others. We have made configurations that exclude all front-end related performance metrics for the results in this article. The obsessive focus on back-end performance is what in the end will allow you to build a fast front-end. 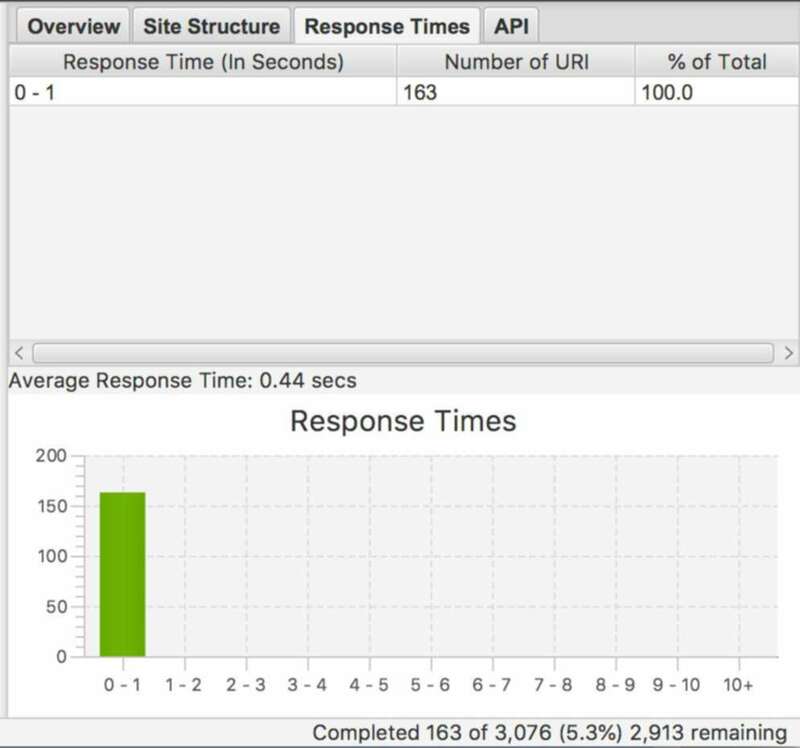 The average response time of the first request on any random page load on your site is the single most important thing to pay attention to. If the response time of the first request is slow, your site will never feel fast no matter how much you optimise the rest of your webpage. The reasoning for a quick first response time is very simple. Your site has to respond within the blink of an eye, else the delay will be noticeable for the visitor. In practice that means you have about 400ms to make the page and get it delivered to the end user (including network latency). A small subset of the pages respond in the 0-1 second rage (typically cached), while the majority of pages respond in 2-3 seconds, and the average over all pages is approximately 2 seconds. 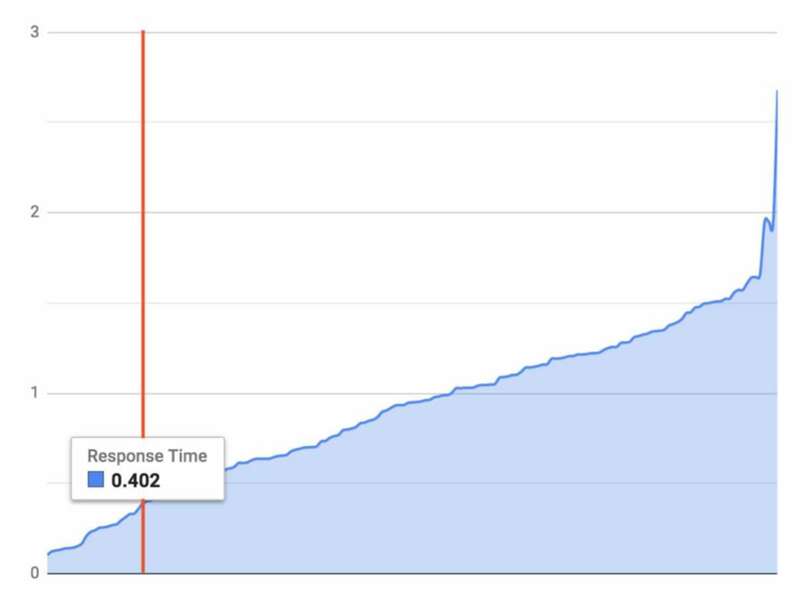 When your response time distribution looks like this, your website is having performance issues – and you need to get your hands dirty to improve the performance on all pages. Caching won’t save your day. What people think they get with caching, but don’t – are the following numbers. These are from a highly dynamic high traffic E-commerce website that runs completely without full page caching, and where absolutely all requests to the website respond in under 0.5 seconds. To relate this to the WP Engine website’s loading times, this graph is delivering 100% of page views in ~0.4 seconds, whereas WP Engine does this only for about 15% of pages on their own website. How do you want your site to perform? What kind of improvements will affect all parts of your website? When you have turned off caching and you can touch and feel the real performance of your website, and started tracking some real user performance metrics – you are ready to start implementing improvements that affect the performance of your whole website. At the end of the day, investing your time on solving general performance issues will make you work a lot less – and give you much better results in terms of web performance, than by trying to solve performance issues for only parts of your site. Switch to better hosting – Servebolt delivers out-of-the-box performance that outpaces any VPS or Cloud instance. Erlend founded Servebolt in 2014 (back then named Raske Sider – meaning “Fast Pages”), and is currently growing Servebolt internationally from the offices in Hilversum, Netherlands. The passion for performance has been growing ever since the web started to get slower. Servebolt is part of the remedy. Erlend is a serial-entrepreneur, loves start-ups and has founded a series of companies the last 20 years. The Internet has always been his domain.